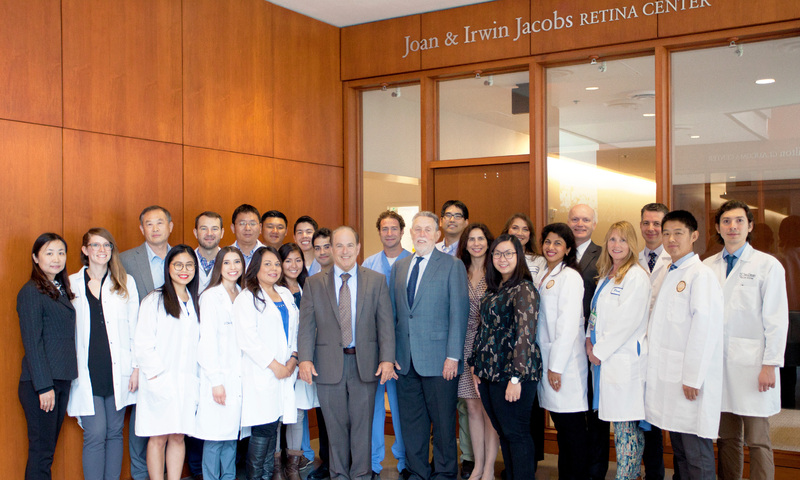 The UCSD two-year clinical vitreoretinal fellowship occurs at the Shiley Eye Institute, Department of Ophthalmology at the Jacobs Retina Center at the University of California, San Diego. The fellowship provides an intensive clinical experience in all areas of vitreoretinal disease. The fellowship is co-directed by Drs. Freeman and Goldbaum and provides rotations with three experienced vitreoretinal surgeons and additional experience in human genetics and pediatric retinal disease. During the two-year fellowship, candidates will be working in clinical locations at the Shiley Eye Institute in La Jolla as well as the UCSD Medical Center in Hillcrest and the Veterans Administration Hospital in La Jolla. Opening in September 2003, the Jacobs Retina Center is a 13,000 sq. ft. facility which directly adjoins Shiley. This has expanded our retina facilities and houses new state of the art lasers, imaging devices, and a clinical trials center as well as laboratories and will enhance your experience. Surgeries are performed at the UCSD Shiley Eye Institute in La Jolla, the Veterans Administration Medical Center and UCSD Medical Center in Hillcrest where fellows will be working with the same equipment and under the same conditions as faculty. Fellows will have clinics in which they are initially responsible for patient care and will also be seeing patients in clinics with faculty. At all times one of the UCSD residents is assigned to the retina service and there is an opportunity to interact with international fellows. Our graduates come from all over the world. It is important to us that the fellows have an excellent experience here and are happy. Fellows will be involved in research and this research will result in presentations at the Association for Research in Vision and Ophthalmology (ARVO), the American Academy of Ophthalmology (AAO), and possibly other meetings. Retina Fellows who have completed the clinical fellowship here have been authors on several peer-reviewed publications by the time of their fellowship completion. We believe that involvement in research enhances clinical acumen and the ability of the fellow to function as an independent retinal specialist and consultant. Experience in research will help them evaluate other’s research and help them keep abreast of developments in our field. Fellows are exposed to medical and surgical retinal problems as well as pediatric problems and infectious problems of the retina during your experience here. Surgical experience will include work with a diode, solid state and infrared laser photocoagulation of the retina in patients with diabetes, macular degeneration, and a host of other diseases. Fellows are involved in the interpretation of fluorescein, ICG, and scanning laser imaging, autofluorescence, and other imaging techniques. We have several of these instruments in use both clinically and in research projects here at the Shiley Eye Institute. Fellows will also work with ultrahigh resolution and spectral OCT, combined angiography/OCT devices and other imaging instruments not yet widely available. Surgically, fellows are involved in repair of both simple- and complex retinal detachment, diabetic retinopathy, proliferative vitreoretinopathy, trauma, and all types of vitreoretinal surgical problems. They will be comfortable utilizing the surgical microscope as part of a three-port pars plana vitrectomy, 20, 23 and 25 gauge vitrectomy, epiretinal membrane dissection, use of silicone oil, perfluorocarbon liquids, endolaser therapy, long-acting gases, and other advanced modalities. In addition to standard therapeutic interventions, fellows are trained in experimental therapies including intravitreal injections of new drugs, including intravitreal implants, small interfering RNA, and experimental drugs for dry AMD, protoporphyrin therapies, prophylactic treatment to prevent macular degeneration, and other new therapies as part of clinical trials. Didactic work here includes a weekly research conference, a weekly clinical conference, fluorescein angiogram conferences, and other venues in which patients are formally discussed, patient charts are reviewed, and recommendations made in a teaching situation. Our most important goal at UCSD is that our fellows have an outstanding educational and surgical experience as well as being happy here in La Jolla.